Blurb: Switching from industrial/rock to ambient horror, the duo behind Stayte produces a lovely audio accompaniment to a tale of internalized terror and paranoia. While we all wait for Stayte to produce a new album, the duo behind the Canadian industrial/rock outfit – Joshua Bradford and Clayton Worbeck – has certainly kept busy in the interim, touring and recording two albums as part of Al Jourgensen’s RevCo, along with several remixes for various high profile artists. 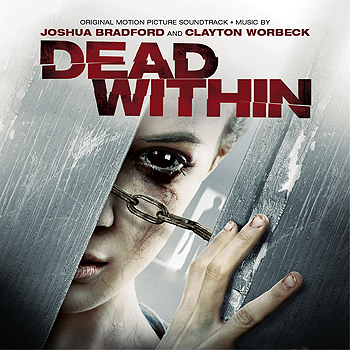 With this soundtrack to indie horror movie Dead Within, the pair showcases their compositional skills in a different light, concentrating as any good score does on adapting and accompanying the movie’s themes and visuals into music. Of course, when one hasn’t seen the movie in question, it can be difficult to comment on the effectiveness of the music, forcing one to simply listen and take it on its own merits. However, in the case of Dead Within, even a synopsis of the plot – a couple attempts to survive a zombie apocalypse hiding out in a cabin in the woods, the man regularly leaving to gather supplies while the woman remains in abject terror at what terrible fate may await them both – is enough to provide a sense of the score’s atmospheric intent and impact. From the throbbing bass line and icy piano and synth melodies of “This Is What Remains,” the effect being something akin to the likes of John Carpenter or Dario Argento, the album begins on an immediately dour and eerie note that sets up the mood for the impending tale of fright quite well. Throughout the score are moments of beautifully lush orchestrations of haunting melody and hollow ambience, the chilled pianos of “Wishful Thinking” evoking memories of a simpler, less horrific time half-forgotten when faced with the creeping menace of tracks like “H2No” and “Ptzd,” the latter especially noteworthy for its scarified industrial pulse not dissimilar to Akira Yamaoka’s scores for the Silent Hill video games. The same can be said for “Hypertonic Solutions / Trolling for Truth” as a choppy electronic beat set against dismally distorted bass is simple sonic tension, while “I’m Not Going to Let You In” groans and bellows with the threat of impending violence… but when the moment arrives, instead of the explosive release some might expect, the music recoils into a quiet, almost empty resignation to a fearful fate. The pianos of “Wishful Thinking” reappear in “You Can Kill with a Bat” and “It’s Black,” placed atop skitters of mangled voices to create a nightmarish reverie of humanity’s past, the twinkling music box melody in the reprise ending things quite unsettlingly. “Eudora Fordycio” closes the album out with a heavy helping of synths that once again bring us back to the scores of Carpenter and Goblin, adding just that classic horror touch to Dead Within. Even without watching the movie, Bradford’s and Worbeck’s score is a wonderful audio accompaniment to the dark impulses that reside within us when we are at our most frightened, giving voice to the violence and despair of paranoia. Although it bears very little resemblance to what the duo produce as Stayte, free from the boisterous and lyrical trappings of industrial/rock, it would not be difficult to hear traces of their production savvy and tonality in the music of Dead Within. As a soundtrack score for a horror movie, the album may be perhaps too esoteric for most, but if you have a taste for the darkly ambient, then Dead Within is well worth the listen.